(Newport, Oregon) - The Oregon Coast Aquarium released seven common murres Wednesday after having been rehabilitated by Aquarium aviculturists. The birds were found as chicks on the beach this summer, separated from their parents. The aquarium aviculture staff raised the young murres to the age when they can fly and dive underwater for fish on their own. 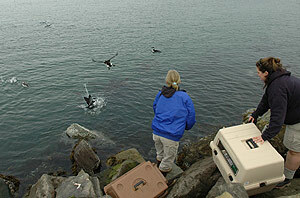 Normally, at about 3 or 4 weeks of age, murre chicks jump from their nest rocks at Yaquina Head and are taken offshore by their male parent, who finishes raising them at sea. If the parent and chick become separated and cannot find each other, the young chick can’t survive on its own. Aviculturist Lissy Moore assisted Aquarium Curator of Birds, Karen Anderson, as they lifted the carriers and climbed over the rocks of the jetty to release the birds. The aviculturists sat on the rocks and watched through binoculars as the birds flew a short distance and began diving. The said they were pleased, as this is a good sign of full recovery. The birds had been living in a big tank which allowed them room to dive and exercise as they grew up. As the murres swam and bathed near loons and grebes on the outgoing tide, Wednesday’s calm wind and water conditions in the bay seemed favorable for a successful transition to a life at sea. The cost of caring for the birds will be covered by grants from the Kinsman Foundation and the Hugh and Jane Ferguson Foundation. 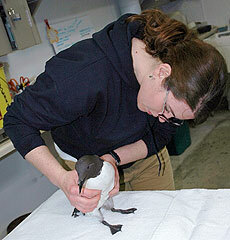 The grants were awarded to help cover the cost of providing urgent care for sick and injured marine mammals and birds. The Oregon Coast Aquarium has rehabilitated and released (when possible) injured seabirds, tropical sea turtles, and marine mammals including various endangered species. Although many such distressed animals are in such poor condition upon arrival that they do not survive, there are those that are successfully rehabilitated and returned to the wild. People who find an injured animal are asked not to touch it or bring it to the Aquarium, but to call the Aquarium or Oregon Department of Fish & Wildlife. www.aquarium.org.